Just released another audiobook with my narration! I made a mistake in accepting this book due to the author’s request that there be no separation between the voices. I take full responsibility, but the result is that I have gotten some bad reviews saying things like “He did not seem to try an do a feminine voice.” and “I could not hear any distinguishing changes in the narrators voice for the various characters or situations.” Well… the author expressly didn’t want me to do a feminine voice or have variations in the characters. If you listen to my other books, it will be apparent that I do try, and hopefully succeed. 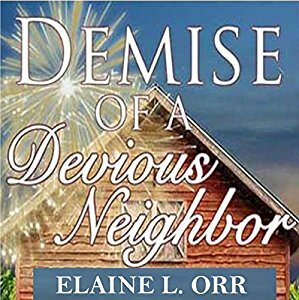 This one is a cozy mystery called Demise of a Devious Neighbor by Elaine L Orr. It’s book two in her River’s Edge Cozy Mysteries series. If you like a little intrigue and murder, but something you can cozy up with and not have nightmares over, this is for you! Also, it’s a stand alone book. No need to read Book 1 first. The reverberating bangs shake Melanie Perkin’s nerves. Either someone’s aiming at her truck, or they don’t know fireworks are supposed to go upward. Could things get any worse? Yes. The next day she discovers a dead body in the barn on her late parents’ farm, Sheriff’s Deputy Granger’s gun pointed at the chest of a primary suspect – someone she holds dear. Illegal merchandise flooding the small Iowa town of River’s Edge, upcoming Fourth of July activities, and a half-finished manuscript all hinder her determined efforts to solve the crime before an innocent person is convicted of murder. In this, the second novel in beloved cozy mystery writer Elaine Orr’s River’s Edge series, the author once again offers humor, believable characters, and tight prose as she carries the listener to an exciting climax. Those who follow her Jolie Gentil series will find themselves right at home. You won’t want to miss this one! Find more from the author at www.elaineorr.com. Next Post What’s the Frequency?